I really wanted to call this series of articles "10 Plants Every Gardener Should Try in the Landscape," but this seemed a bit long for a title. Whatever you call them these,10 plants should be great in landscapes in almost any climate. They were chosen to be heat tolerant, to need limited to no supplemental water and to be easy to care for with no deadheading needed. I've grown them all (most of them repeatedly) and love them! One of the joys of gardening is seeing what kinds of (non-destructive) wildlife you can attract to your garden. Perhaps the most sought after visitors are butterflies. There are many places to go to find which plants attract butterflies (Proven Winners Advanced Search) and one of the most often listed plants has got to be Butterfly Bush (Buddleia). Buddleias top the list for very good reason, they are excellent attractors of butterflies. 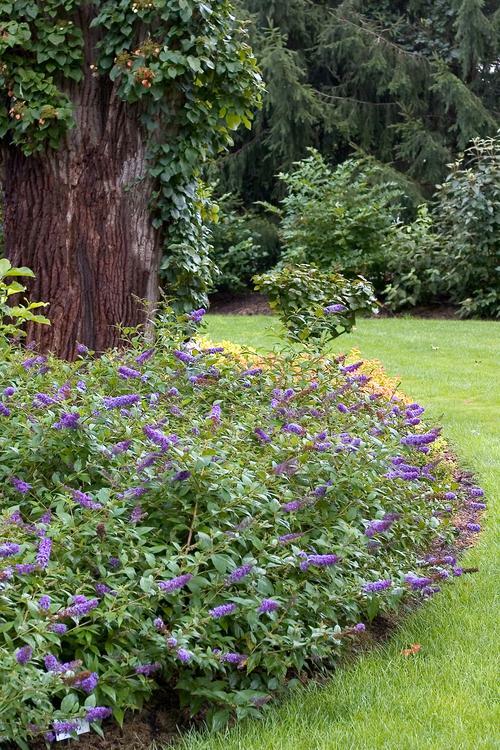 However, for many people Butterfly Bushes have one major drawback - they get HUGE! Their size means they are sometimes difficult to incorporate into the landscape or simply don't fit in smaller size gardens. Well, Lo & Behold® 'Blue Chip' fixes that problem. It only grows two to three feet tall and also spreads only two to three feet. It is very densely branched and will bloom with a steel blue flower pretty much all summer - without deadheading. It is also sterile, which means it won't set seed. For most of us this isn't an important feature, however, there are some areas of the country where Buddleia is considered an invasive plant. Since it doesn't set seed, Lo & Behold® 'Blue Chip' is an ideal plant for areas where invasiveness is an issue. Lo & Behold® 'Blue Chip' is also very versatile. It can be used as a small growing shrub, but because of it's compact size you can also incorporate it into a herbaceous border, where it will function almost more like a perennial than a shrub. The photo above shows my mixed border, you can't really point out the Lo & Behold® 'Blue Chip', it mixes seemlessly with the annuals and perennials in this border. This year, I am giving it a bit more space so it becomes more visible. It also looks great in massed plantings by itself. The photo at left shows how effective it can be when planted as a massed groundcover. You might be thinking, wait this has nothing to do with me, I garden in containers only. Well, Lo & Behold® 'Blue Chip' is great in containers, too. I used it in a container the first summer I grew it. I started it from a plant in a 4-inch pot and put it in a 12-inch container (photo below right). It was amazing! In my mind, the plant went from this little twiggy thing to this incredibly, well-branched puff-ball bristling with blue to purple blossoms. I know it only seemed like it happened overnight, but it looked great really fast and stayed that way all summer. One thing to keep in mind if you are growing a shrub in a container, the rule of thumb is that a perennial or shrub in a container needs to be two zones hardier than the zone you live in for it to survive the winter in a container. I cover this topic in depth in another article. Since this plant is hardy to zone 5 and I live in zone 5 I knew that it wouldn't survive the winter in a container. Fortunately, I had just added a new flower bed and I planted it there(the photo above right). This plant is quite easy-to-grow. Simply provide it with at least 6 hours of direct sun a day, a dose of controlled release fertilizer or compost in spring, preferably well-drained soil and just let it do its thing. If you are growing it in a pot, you will also need to water. In landscape beds, it is pretty drought tolerant once established and shouldn't need supplemental water except in extremely dry conditions. Trim it back to about a foot in early spring and then wait for it to awaken for the year. This is a plant you must have patience with in spring - it is slow to begin growing. In fact, your other plants will be up and growing and it will (like all Buddleia) just be starting to show green. Make sure you don't give up on it too soon. I have three Lo and Behold, and love them...Well two of them anyway. I planted in spring of 2012 . Shortly after blooming the plant in the middle started to decline. The plant looked as if it was wilting due to lack of water. The other two plants were fine. Over the couse of 5-10 days the plant died. I replaced the plant in the fall of 2012. All the plants looked healthy in spring of 2013after coming thru the winter. They all started blooming about two weeks ago and looked gorgeous. About 5 days ago the middle plant started looking weak. The leaves started drooping. Today they are brown. There are a few stems with leaves that look OK, but I'm not hopeful. The other two plants are just fine. They all get the same water, fertilizer and sun. I would say there is definitely something in the soil in that particular space. Take a one pint sample to your extertion center. With compost and wood mulch my Lo and Behold has grown much larger than advertised. It 's at 4 1/2 feet high and it is only mid July here in USDA Zone 6. I had cut it back severely last Fall. Today it still had the PW tag on so I'm completely sure of what I planted. Two years ago I planted it just south of a Japanese maple sapling expecting the purple butterfly blooms to fill in below and complement the reddish maple leaves. Surprise! Now the plants are nearly equal in height. Would you like a photo? I planted a lo and behold this spring. The branches and twigs are spliting and falling off. It is in full sun, and I have been fretilizing with rapid grow fertilizer every three to four weeks. No sign of insects. What is my problem? More isn't always better. Rapid grow fertilizer every 3 or 4 weeks? Why? That's unnecessary. Few plants grow as quickly as a lawn and grass is fertilized just 3 times a year. Buddleia are a woody shrub so fertilizing once, in early Spring, is usually enough. Are you watching dead (brown) or live (green) growth splitting? Brown may mean an insect or virus attack. Loss of green is more likely all that chemical fertilizer that you're soaking the roots with.